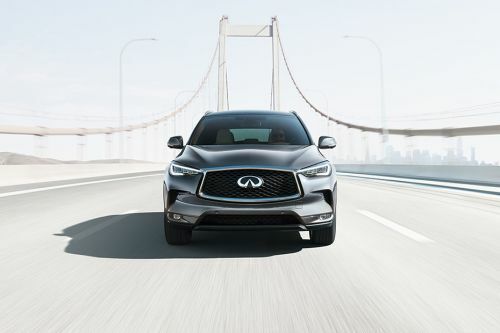 The 2019 Infiniti QX50 might be available in the UAE with a price value starting around AED 162,000. This 5-door car belongs to the premium compact SUV class. It is only offered with a 2.0-litre TC inline four-cylinder engine with both FWD and 4WD mechanism. With this, the car can hit a top speed of 230 kmph. The fuel economy stands at around 7.5 litres for every 100 km. The safety features incorporated in the vehicle, attractive design and the ease of handling make the car a desirable one. Being from a premium automaker, it is expected to be getting quite a lot of features as well. Besides the 268 PS of power and 380 Nm of torque, it would be getting quite a lot of safety features that would perfectly justify the price tag. QX50 2019 is available in 9 different colors - Graphite Shadow, Chestnut Bronze, Liquid Platinium, Majestic White, Hermosa Blue, Black Obsdian, Dynamic Sunstone Red, Lunar White and Eclipse Black.